Samsung QE65Q7F review | What Hi-Fi? Although QLED is a relatively recent invention, we already know what to expect from a QLED TV – the sort of punch Anthony Joshua would be proud of, peak brightness with the ability to make you wince, and edges so sharp you could cut your fingers on them. The Samsung QE65Q7F delivers on all of these things. However, we have also come to expect pretty poor viewing angles and the inevitable intrusion of a backlight in overdrive. Unfortunately, the Q7F delivers these elements too, but on the plus side, it meets our expectations of a fundamentally different approach to its OLED rivals – and a cheaper price tag. QLED’s biggest advantage over OLED is its brightness. Even the latest OLEDs fall significantly short of most backlit TVs for peak brightness, and so a flagship backlit TV (for that’s what a 2017 QLED is) should be a whole other level of eye-enticing sensationalism. Play Planet Earth II in HDR from the 4K Blu-ray and, sure enough, the Samsung delivers sizzling sunsets, shimmering seas and sparkling snowscapes. It’s not just the brightest parts of the image that benefit either – everything this TV displays is served with an extra dose of punch and vibrancy. As the camera pushes through a jungle, the whole scene pops from the screen as sunlight bounces off the lush, green vegetation. The crabs that inhabit the forest floor are resplendent in their fiery red shells, and the azure tones of the ocean are more tempting than a holiday brochure. Bright, colourful scenes are a QLED’s bread and butter, and utterly spectacular when viewed on the Q7F. It’s when you feed the TV a dark scene with bright elements that you encounter QLED’s inherent limitations. This TV relies on a backlight to shine light through a separate panel (here made up of quantum dots) and that backlight can’t help but draw attention to itself. The backlight is surprisingly uniform, particularly for a TV this size, but there’s no avoiding the fact that, in order to get light to a bright element in the centre of an otherwise black image, it has to be passed from the LEDs around the edge across the whole panel. This inevitably makes the blacks a little less black, but the biggest issue is that you often notice the change, particularly in the bars at top and bottom of a cinematic presentation, as the backlight does its thing. MORE: Ultra HD Premium – What are the specs? Which TVs support it? The vast majority of TVs are backlit, and this one is well implemented. But at this price, you’re entering backlight-less OLED territory, so it becomes more of a cause for complaint. The OLEDs we’ve seen this year have all had impressive viewing angles, while the Q7F, like its sibling QLEDs, quickly loses vibrancy and contrast as you move off-axis. But there’s so much that this TV does well. Detail and sharpness are exceptional, and that results in images that are impressively three-dimensional and detailed. While the super-vibrant colours and bright elements might not be true to life, they’re turned up to 11 in a way that doesn’t feel over the top. 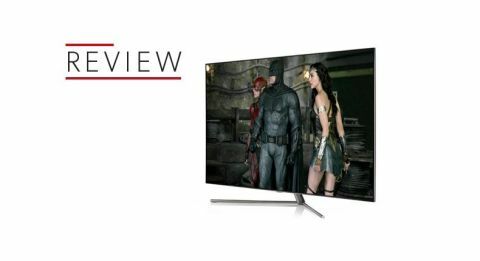 You might expect that a TV geared towards 4K HDR content would lose its way when given 1080p content, but there’s still plenty of punch and detail, impressive edge definition and a way with colours that’s both enticing and nuanced. Drop down to standard-def and the image is still watchable, with a degree of finesse and balance that would have seemed impossible on a screen this large just a few years ago. However, LG’s 2017 OLEDs are even better in this regard. Whatever the resolution, the Q7F handles motion well, but not perfectly. Here you have to choose between a slight soap opera effect and a bit of blurring, while Sony’s 2017 TVs manage to combine crispness and naturalism. We prefer the Samsung with the motion processing turned off entirely, and the little bit of blurring you get certainly isn’t too off-putting. One area in which this TV (and every Samsung we’ve tested this year) remains unbeatable, is input lag – the time it takes for your inputs on a PlayStation or Xbox gamepad to be represented on-screen. Here we measured just over 23ms when in Game Mode, which is lightning-fast. Input lag doesn’t really need to be this low, and you shouldn’t be put off a TV that’s a bit slower, but the QE65Q7F is a lovely TV to play games on – the panel’s punch and vibrancy working well with computer-generated content, particularly from an HDR console. The Samsung QE65Q7F has a combination of good out-of-the-box settings and a selection of simplified settings, making it easy to set-up the optimum picture. We start with the Eco Solution sub-menu and turn off every option. Environmental concerns aside, the power-saving options are too detrimental to picture quality. After running the THX Optimizer disc, we find the Q7F looks best with a few points taken off the Brightness, Contrast and Sharpness settings, Local Dimming switched to Low, and Auto Motion Plus and the Contrast Enhancer turned off. Bear in mind that when the TV senses an HDR signal from any source (it supports HDR10 but not Dolby Vision) it will switch to a new set of defaults, labelled as Standard. Thankfully, these defaults tend to get the best out of HDR content. You’ll need to switch the Eco settings off again, and the motion processing options, and we’d suggest a few points taken off Sharpness, but that’s about it. You should now have a gloriously punchy, but nicely-balanced, HDR image. The wand-like remote control is a well thought-out bit of kit, minimalist but with a snappy, intuitive UI to get you to whatever you’re after quickly. The conventional plastic controller’s number buttons make channel-hopping a bit quicker, but we prefer the sleeker, snazzier zapper – even if we barely use the voice control function. It’s a shame that neither remote has shortcut buttons for the likes of Netflix or Amazon Prime Video, but the Samsung does a good job of keeping your most frequently accessed apps at the top of the Home menu, and you can quickly and easily reorder your sources based on your favourites. The Samsung app has everything you could reasonably expect, from Netflix and Amazon and all the usual catch-up services, to the less common Now TV, Google Play Movies, Spotify and Plex. The only disappointment is Samsung’s own TV Plus, which launched with the promise of streamable 4K HDR content, but has far too little of it to get excited by. The QE65Q7F’s connections are housed in Samsung’s separate One Connect box, which means a slimmer set (4.5cm at its thickest) and fewer cables dangling from the back. This connects to the set via an impossibly thin and generously long optical cable that helps the screen maintain its neatness. It’s worth playing with the options in the Sound menu. We find that the Optimised mode, which adds punch and weight, is good for action movies, but for most general viewing, we are better served by the Standard mode. The sound is relatively full-bodied by flatscreen standards, and there’s plenty of detail and clarity for everyday viewing. Adding even an inexpensive soundbar will transform your audio experience, though, and we’d recommend you budget for at least one of those, if not a proper surround system. The QE65Q7F delivers all of the good things we’ve come to expect from Samsung’s QLED’s – punchy, vibrant, vivid and sharp images that pop from the screen and dazzle the viewer in the best possible way. The same compromises are there, too, in the form of relatively poor viewing angles and a backlight that’s occasionally distracting. LG’s OLEDs have their own weaknesses (most notably a relative lack of brightness), but we feel they provide a better overall picture. Some of Samsung’s previous QLEDs have received the full five stars by significantly undercutting the OLED equivalent on price, but at just £300 cheaper than a 65in LG B7, the QE65Q7F is a bit too close for comfort. Still if you want a TV that dazzles with HDR content first and foremost, you won’t be disappointed with the Q7F.